This map shows the average life expectancies of babies born in the D.C. region. The neighborhood where someone is born can shape their health and affect how long they will live, according to the Center on Society and Health at Virginia Commonwealth University and the Robert Wood Johnson Foundation. A new report from the Center on Society and Health at Virginia Commonwealth University and the Robert Wood Johnson Foundation shows an 8-year gap in life expectancies across four counties in Maryland and Virginia plus the District. 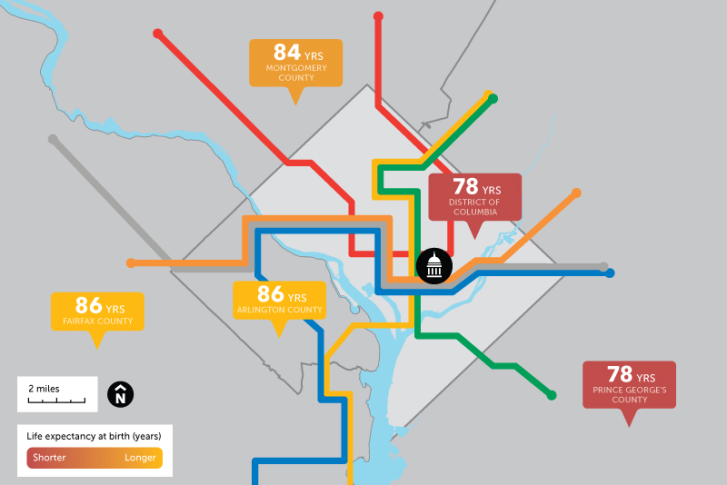 WASHINGTON — The difference of a few Metro stops could determine whether D.C. area babies will live a long, healthy life or face a shorter life expectancy. A new report from the Center on Society and Health at Virginia Commonwealth University and the Robert Wood Johnson Foundation shows an eight-year gap in life expectancies across four counties in Maryland and Virginia plus the District. The gap is likely even wider among ZIP codes within those communities, said Dr. Steven Woolf, the center’s director. “If you are born in Arlington and Alexandria, or more dramatically places like Loudoun County or Fairfax county, we see much higher life expectancies than if you are born in Southeast D.C.,” Woolf said. Following the Blue and Orange lines, babies born in the District and Prince Georges County can expect to live 78 years, compared to an expected life span of 86 years in Fairfax and Arlington counties, and 84 years in Montgomery County. In comparison, the average life expectancy in the U.S. is 79 years. The center at VCU has mapped out health expectancies for other major U.S. cities, where the gap in life expectancy can be as high as 15 to 20 years between affluent neighborhoods and low-income neighborhoods, Woolf said. Higher education levels, higher incomes and even neighborhood conditions — like access to parks and safe housing — contribute to better health outcomes for residents in more affluent areas. The opposite is true in more disadvantaged neighborhoods where housing conditions can expose children to allergens or air pollution from industry or highways, and where residents lack safe places for children to play and lack access to nutritious food. Other factors such as unreliable, or expensive, public transportation can also affect life spans because they can hinder residents from accessing jobs, medical care, child care or even social services, according to the report. “Our health is shaped much more by the conditions in which we live,” Woolf said.